Aquatic plants add color and vibrancy to water ponds, gardens and containers. Grown in a wide range of shapes, sizes and colors, each with its own distinct growing requirements, some aquatic plants are ideal grown in shallow ponds while other thrive in deep water. Some aquatic plants prefer the bank or edge to create a lush display along perimeter of the pond, while others are seen floating along the water's surface. Anatares (Nymphaea 'Antares') is a type of waterlily variety that blooms at night. The cup-like, 6- to 10-inch-wide, dark red blooms are fragrant and shoot up just above the foliage of the plant. The 10- to 12-inch-long green leaves on anatares waterlilies have a bronze tinge when young. Anatares is an ideal waterlily to use in medium or large water gardens. They grow best in direct sun. Plant anateres waterlily in USDA zones 10 to 11. Sacred lotus (Nelumbo nucifera) is a type of lotus that grows 3 to 6 feet tall and 3 to 4 feet wide. 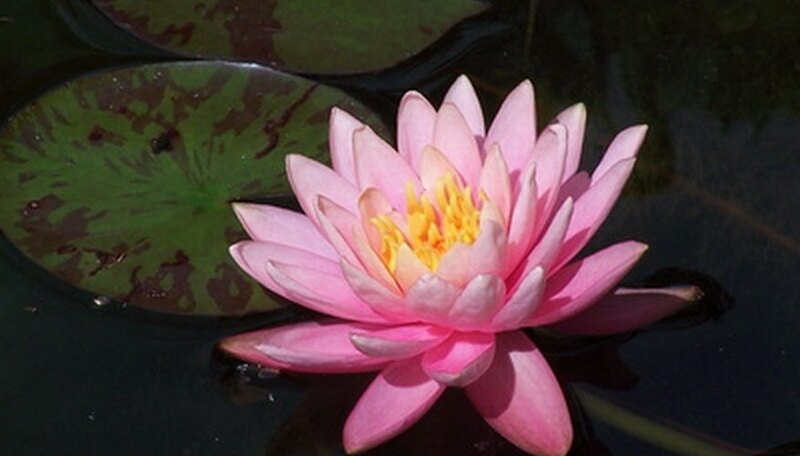 The cup-like, 8- to 12-inch-wide pink or white blooms on the sacred lotus are fragrant and appear in summer. Shooting from the stiff stems above the foliage, sacred lotus flowers are followed by the 2- to 3-inch-wide, nut-like fruit that according to Missouri Botanical Garden,â?? look like the shape of a watering can rose. (See References 2).\" The 2-inch-wide, rounded, parasol-like, green waxy leaves on sacred lotus grow above the water on a long petiole. Each sacred lotus bloom flowers for three days, appearing in the morning to come to a close at night. Sacred lotus grow best in full sun and calm, loamy water. They are suitable to grow in USDA zones 4 to 10. Water hyacinth (Eichornia crassipes) is a floating water plant that grows up to 6 feet tall. The lavender to pale blue flowers grow on 6-inch spikes and are dotted with yellow spots. The pale green, shiny and rounded rosette-shaped and balloon-like petioles are swollen with tissue. Water hyacinth requires full sun and warm water temperatures to thrive. They have long, dangling roots that are feather-like. Grow water hyacinth in USDA zones 8 to 11. Water forget-me-not is a marginal aquatic plant that thrives along banks and shallow, low-moving to still water. They grow 4 to 24 inches tall and have pale blue flowers with contrasting yellow centers. Water forget-me-not blooms from May through September, creating a long-lasting season. They form dense colonies and thrive in water up to 3 inches deep. Water forget-me-not grows best in full sun to part shade. They are suitable to grow in USDA zones 3 to 10.